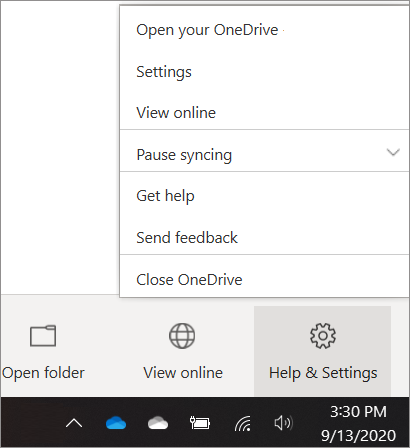 OneDrive will automatically pause when a Windows PC enters battery saver mode, but if you want to stop syncing because you are on a metered or slow internet connection, you can Pause and Resume your sync. Pausing and Resuming can also help if OneDrive status displays "Processing changes" for a long time. Choose how long you wish to pause for: 2, 8 or 24 hours and check that the white or blue OneDrive cloud icons in the notification area show Paused. Note: If you have both OneDrive and OneDrive for Business, you can pause and resume them independently. Syncing will resume automatically after the Pause time has finished, or you can manually Resume syncing at any time.